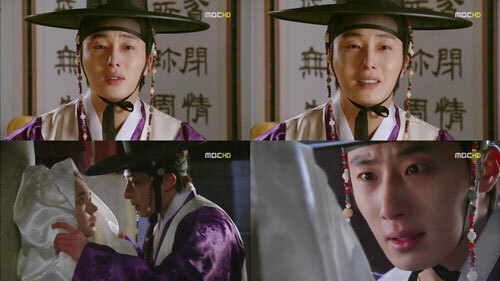 Jung Il Woo is shedding tears in The Moon Embracing the Sun, moving the audience to tears. In the episode 10 of The Moon Embracing the Sun broadcast on February 2nd, 2012, the harrowing and innocent love of Prince Yang Myung is shown. When Yang Myung is drinking together with Yeom, he confessed his remorseful love to Yeon Woo that have been forbore for 8 years. The only time his heart was revealed after the death of Yeon Woo, was during the time he told Hwon that if Hwon cannot protects Yeon Woo to the last, he should give her to him. Yang Myung tells everything beginning from since he knew Yeon Woo to still loving Yeon Woo at present to Yeom, touching viewers. For Yang Myung who is treated coldly during childhood in the royal family, the Yeom’s family is the only place he can linger. He met Yeon Woo there, allowing her to become his only and the first lover in his life. Once he ignore his love to Yeon Woo because of romance between Hwon and Yeon Woo, however inside his heart, he never wavers, that is why Yang Myung is feeling sad inside his heart. And after the years, he always want to display the unreleasable love. At the end of the drama, Kim Soo Hyung has almost recognized Han Ga In, and the look of Jung Il Woo asking Han Gain if she recognizes him is raising the anticipation of audience.